Arnold Spirit, Junior, has only known the Indian reservation that his family has lived on for generations. The kids tease him relentlessly for the birth defects that make his head too big, his eyes lopsided, and his speech stuttered. But Junior has always believed "Better the devil you know than the devil you don’t.” That is, until Junior decides to enroll in the local all-white high school twenty-two miles away. Now Junior has to face ridicule on both fronts, from the students at his new school and the kids he’s left behind at the reservation. But Junior learns to triumph as he makes new friends and works hard to break the cycle that has trapped his family for years. This story is unflinchingly honest. 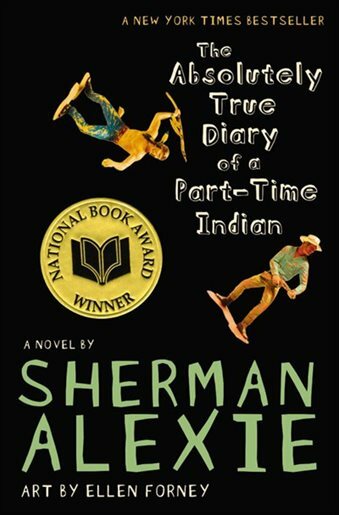 From the sexual habits of a teenage boy, to the racism toward Native Americans, to the disheartening cycle that many suffer from life on a reservation, Sherman Alexie does not shy away from the hard and controversial topics that make up Junior’s story. Instead, he describes, often with dry humor, the challenges that Junior faces as he tries to rise above the downward spiral of generations past. The themes of empowerment, determination, and persistence make this novel powerful. The Absolutely True Diary of a Part-Time Indian is fearless and memorable, though readers should be aware that there are characters who make several racist comments. *Contains moderate language, moderate sexual content, and severe substance abuse.